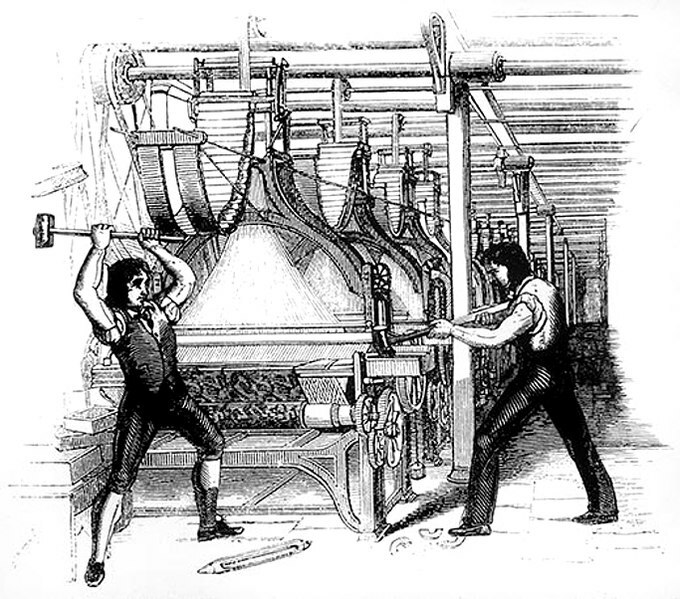 Luddites were English textile workers and weavers in the 19th century who destroyed weaving machinery as a form of protest, but today the word is used to describe people opposed to new technology. Sign up for InDepthNH.org’s free weekly newsletter, mid-week update and Sunday weekender here. Okay, kids. In this column I’m going to tell you the difference between a troglodyte and a Luddite, tell you about the latest craze that everybody is doing, and repeat your mother’s sage advice that if you have nothing good to say about somebody, then don’t say it. Ready? This column that I write on a fairly regular basis for InDepthNH.org is geared to the intersection of technology and privacy, not necessarily in a bad way, but in a way that requires us as consumers to be ever-vigilant. Usually, this march toward progress sneaks up on us, slowly oozing into our lives, changing our daily routines and soon becoming an indispensable part of who we are. I say “usually” sneaking up on us, but this past month has proven to be anything but sneaky, more of a collision course in “us vs. them,” at least as far as technology and privacy are concerned. 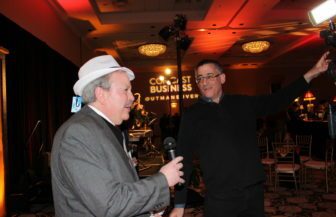 Bob Charest, left, being interviewed last week at the BOBS Award party in Concord. Of course, I’m talking about the Facebook crisis and the wholesale theft of data from 50 million users by a British consulting firm that used this information for lord knows what. The whole despicable act has resulted in politicians and the rest of us asking about Facebook’s privacy practices, people threatening to boycott the service, and CEO Mark Zuckerberg saying he will testify before Congress in April. It’s a crisis for the company, for sure. But a meltdown? I don’t think so. Facebook, I predict, isn’t going anywhere. How else would we be able to share cat videos and remember anyone’s birthday? We’d all become troglodytes, but I hardly think there’s a chance of that since Facebook or some iteration of it will always be around. A troglodyte is a hermit, a person who lives in a cave, usually ignorant or old-fashioned. Our world in the 21st Century won’t allow this for anybody anymore. Many of us prone to protesting Facebook’s lapse would have a tough time even considering ourselves Luddites. These characters are so named because of the English workers back in the early 1800s who destroyed machinery in mills because it threatened to take away their jobs. Now the term is applied to people who are opposed to new technology. Troglodytes and Luddites don’t stand a chance in this new age. To survive in a democracy that encourages the free exchange of ideas and a robust dialog on matters of mutual interest, we need to be able to talk to one another. Facebook has accomplished that. What it has been deficient in doing is encouraging us to listen to other people’s ideas. The whole service is geared to having your own choir preach at you on a daily basis. But I think the best caution I’ve read about Facebook, along with the other social media platforms such as Twitter and Snapchat, comes from wired.com, and it’s a good rule of thumb for all of us: When you’re not paying for a product, you are the product. The business models of these billion-dollar companies is based on offering you up to advertisers. And that latest craze? It’s the Facebook peep show. People are allowed – encouraged – to look at what Facebook has on them by downloading a copy of their own archive. I took Facebook up on its offer and other than reliving a few conversations from a few years ago, I saw only a few items that made me slightly nervous. My ad history revealed that I looked at an awful lot of car sites last year. (I did buy a car, so no car salesmen need call!) Advertisers who have my contact information include a few I would have suspected (Target, Walmart, eBay) but a few that made me wonder (Viking River Cruises, Viking Ocean Cruises). It includes a listing of the several groups that I belong to, as well as a page I administer. In short, no real surprises, but I can see how this information would be helpful to a merchant trying to target customers. I apparently looked at a bunch of articles on retirement. That’s probably why I kept seeing those Viking River Cruise ads. You, too, can get a copy of what you’ve shared on Facebook. To do this, on your Facebook page, at the top right in the blue-shaded portion is a question mark inside a circle. Beside that is an arrow key that if you click on will take you to a box which near the bottom has an entry marked “Settings.” This will take you to the General Account Settings page. At the bottom of this is “Download a copy” of your Facebook data. Click on this, and Facebook will send you a ZIP (compressed) file containing your information. It took less than an hour from the time I requested it to receive this by email. For its part, Facebook is ending what it calls partner categories, a tool that allows advertisers to target users through data-collecting companies like Acxiom, Experian and Epsilon. Facebook has also adjusted its privacy settings to give users more control over their information. All settings are now on one page, and it is easier to change and stop apps using data. Until now changing settings was spread over at least 20 screens. If you use the Mozilla Firefox browser on the Internet, a new extension allows users to prevent Facebook from tracking their activity. Facebook Container will not work at preventing tracking on the Facebook site, just everywhere else on the web. The truly troublesome revelation is that my Messenger communications are archived. (Three Facebook Messenger app users in California have filed a lawsuit against Facebook, claiming the network violated their privacy.) To those of you who use it, remember this point, and a good practice is to say nothing you wouldn’t say in a crowded room with the person you are talking about also present. In other words, take your mother’s advice. See Paragraph 1 above. I’d bet more than a few people wish they had heeded this advice. I watched a saga unfold a few weeks ago on Facebook, and it wasn’t pleasant. I belong to a community news group dedicated to Northwood, and I observed as a debate developed between the local state representative and a local author. It turned into something that I’m sure both wish it didn’t, especially the author, who now finds herself a defendant in a libel suit. Another recent news item revealed the temporary suspension of the Manchester School Chat Facebook page, with 2,500 followers, over postings that sometimes got heated, and at least one school board member was concerned that this could open the school district up to liability, especially if the conversations turned to personnel performance. The site administrator, another school board member, says he does not remove criticism. The board member did reactivate the page a few days later, saying he is sponsoring the page as a private citizen, not as a school board member. He asked that those commenting remain civil, refrain from defamation, cyber-bullying, stalking, harassment and graphic language. That’s good advice for all of us. Without getting into a discussion of libel law because I’m no attorney, I do know someone who is. He is Attorney Greg Sullivan, who has been in this line of work for more than four decades. He has been the New Hampshire Union Leader’s attorney for many years and teaches courses at Suffolk University Law School. Sullivan speaks at local right-to-know and libel workshops, and there are two videotaped workshops I’d like to highlight for you. The first is a March 12 panel that he served on along with InDepthNH.org founder Nancy West and others. Sponsored by the New England First Amendment Coalition and Right to Know NH, the panel covered transparency and the public’s right to know. You can find the video of the conference at this link. But I’d like readers to watch a video that is more applicable to this column, also featuring Sullivan and a fellow attorney versed in libel issues, Peter Caruso Sr., who advises the Lawrence Eagle-Tribune. Their workshop was geared to journalists, but as I have said in a previous column, Facebook is making us all journalists these days. The workshop, The Latest Legal and Ethical Issues Facing New England Newsrooms, was sponsored by the New England First Amendment Coalition and held in October 2016. Watch it here at this link. Sullivan has an interesting presentation on privacy rights, and everyone who uses social media, especially public forums, should watch it. As Zuckerberg goes on his national and international apology tour (which included full-page advertisements in British and U.S. newspapers), we should all use the opportunity to educate ourselves. And if you need a little comedy to lighten your social media overload, take a look at this public service announcement featuring Will Ferrell at this link. Bob Charest has been in the news business since 1977. He has worked at newspapers in Massachusetts and New Hampshire as a reporter and editor. A graduate of Boston University, he has consulted with InDepthNH.org on editing and grant proposals since before its founding in 2015. He writes on topics related to advances in technology and how they have affected our privacy in America. In the interest of full disclosure, he has owned Facebook stock since its initial public offering in May 2012.